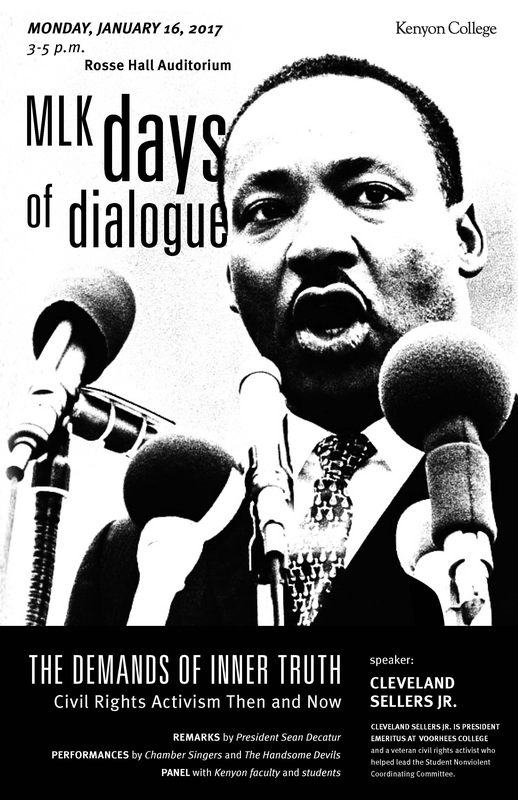 Kenyon’s Office of Diversity, Equity and Inclusion has put together a program of events in honor of Martin Luther King Day, and they really shouldn’t be passed up. We’ve put together an easy guide of what’s happening today and tomorrow and why you should go! Advertised in the above poster, this program features speaker Dr. Cleveland Sellers Jr. a civil rights legend. He will be talking about how activism has changed over the years and what it looks like today. There will also be performances by the Chamber Singers and the Handsome Devils. As a part of the DA Storytime series, Professor Mason will be sharing his child experience as one the first black families in Shaker Heights, Ohio, which will be followed by a discussion.